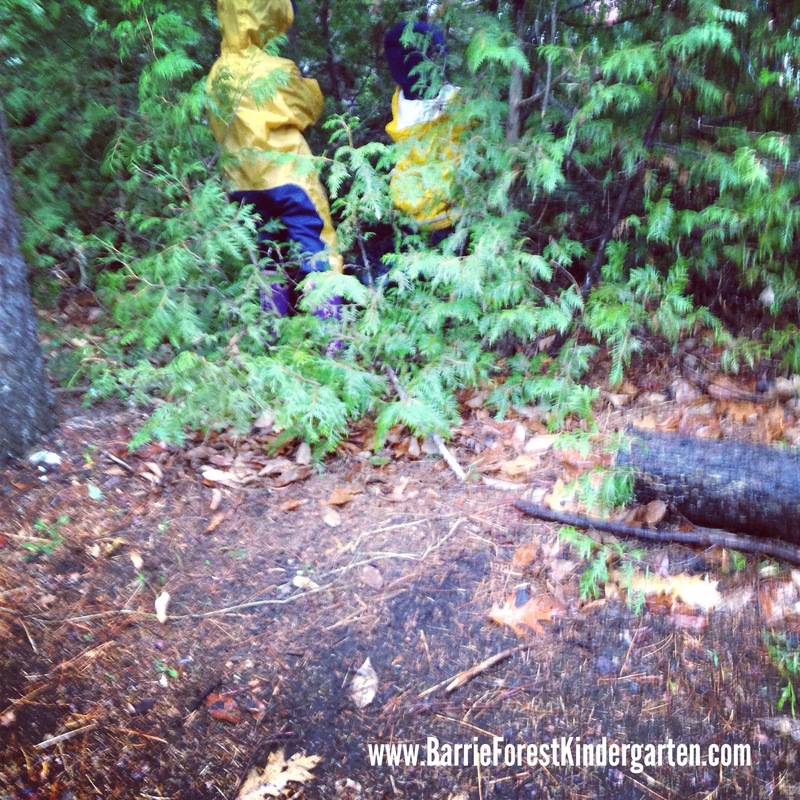 There’s a chill in the air, rain falling to the ground and kids enjoying the woods! 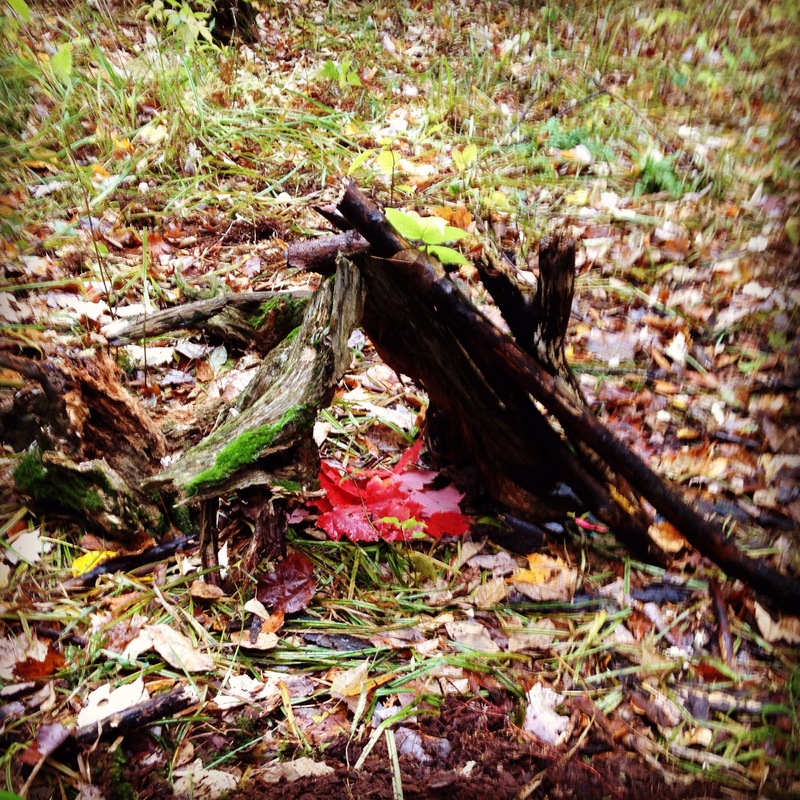 October 31, 2014 October 31, 2014 childongroundLeave a Comment on There’s a chill in the air, rain falling to the ground and kids enjoying the woods! 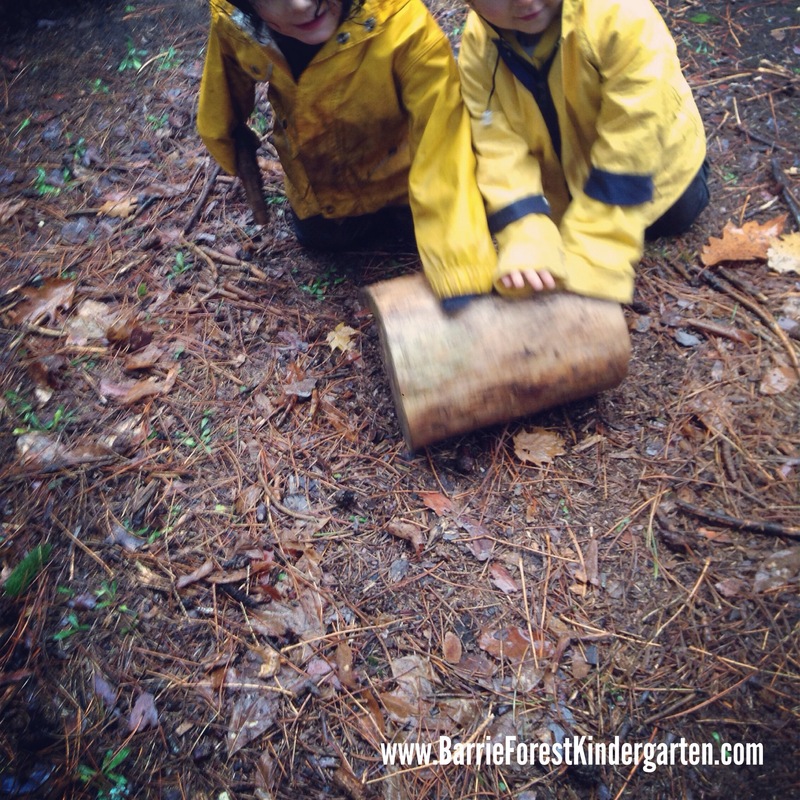 This Last week at Forest Kindergarten……. 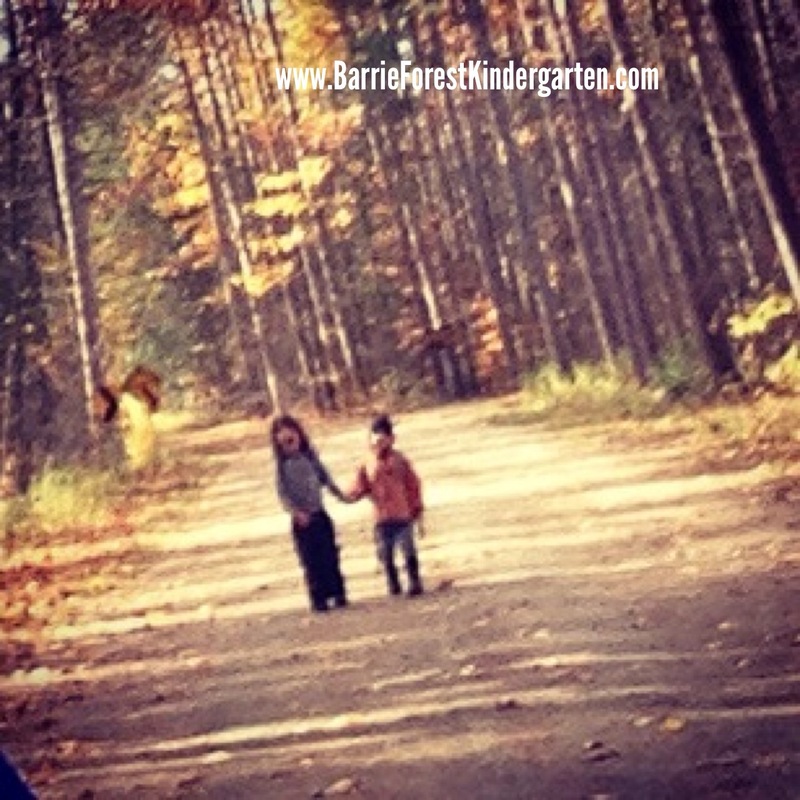 The last week of October brought take me outdoors day on Wednesday which we celebrated every day this week! 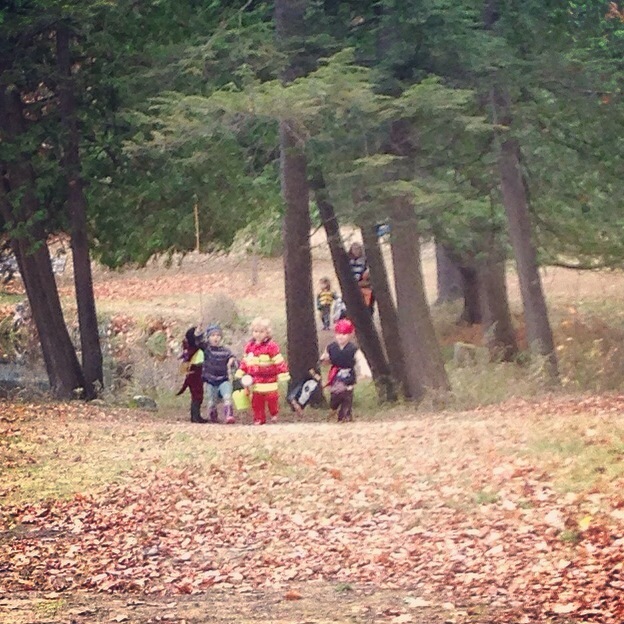 From our Forest Kindergarten program, to our Outdoor Toddler Playgroup and our Kindergarten teacher hosting a special Halloween party in the woods for Homeschoolers this week we felt it important for kids and their families to get out for at least two hours for not just one but every day this week and didn’t want anyone to miss the celebration! The idea of the day is to talk about the importance of getting outside and wanted to share this message with everyone. It was a rollarcoaster of a week from temperature to weather! From almost twenty degree weather to single digits, from rain to dry weather – we loved every day! The warm weather was nice for the parents to relax while kids got to run in the woods with just their costumes (no coats or mitts!) which was very freeing for this time of year. Some of the days brought a crispness that wakes you up better than coffee. And of course we love our chilly rainy mornings. The kids feel so proud to make decisions to keep themselves warm with extra mittens, hats and clothing coming on and off as needed. We have such great families who provide plenty of warm cloths for the kids to make these decisions. We also love that there is no public car access after the drop off area so kids can listen to their bodies and safely run ahead when they need a burst of speed to warm themselves up. 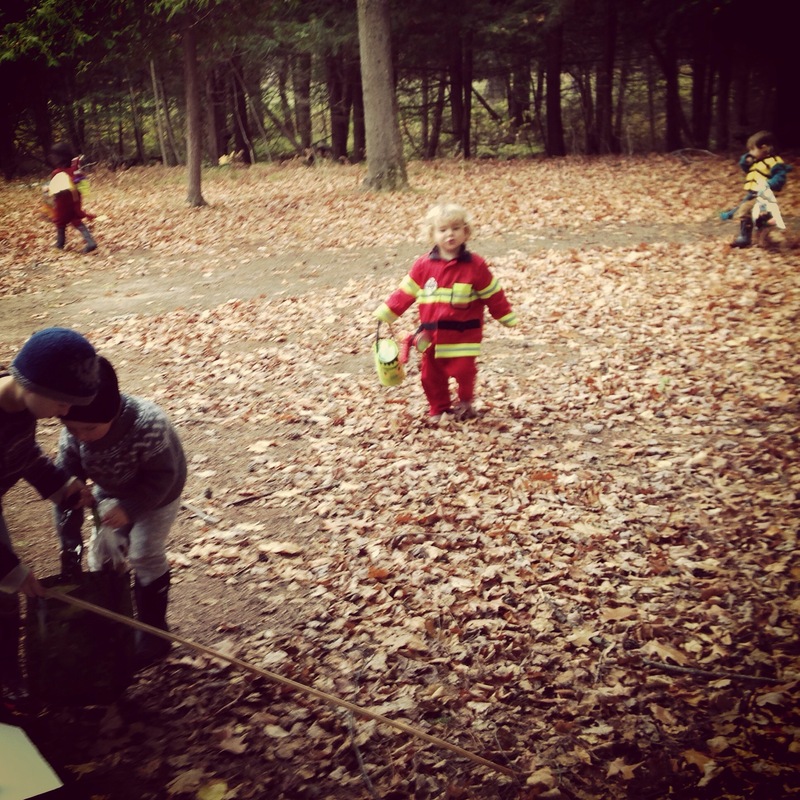 We find that the kids, when given the space do very well at listening to their bodies signals around not just warmth but snack and self regulation. 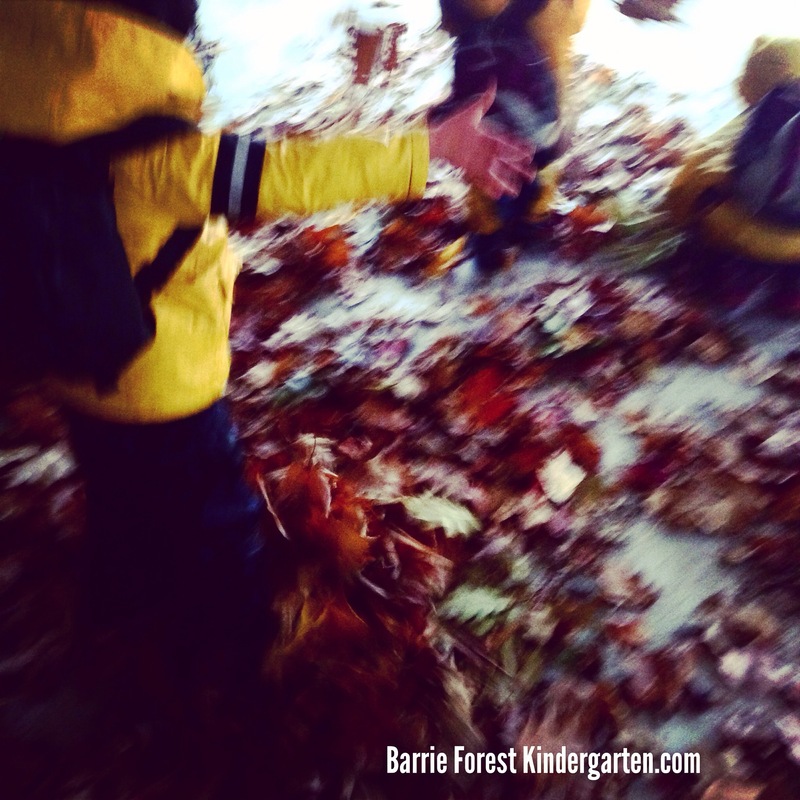 It’s fun to see the adventures they make up to get warm (running), shelter from rain (hiding in trees) and slow down for self regulation (still/quiet activities) – such running from Forest beasts to sheltering / hiding from them, to panning for “minerals” to enjoying fall leaf play it was a fun week! With the temperatures dipping and more rain over the next few weeks we are so looking forward to enjoying the last of the fall crisp wet weather before seeing what winter will bring! Some of the fun we got up to this week! Outdoors! Place based education is focus for the kids this week as all the benefits of it are starting to take root within the class. 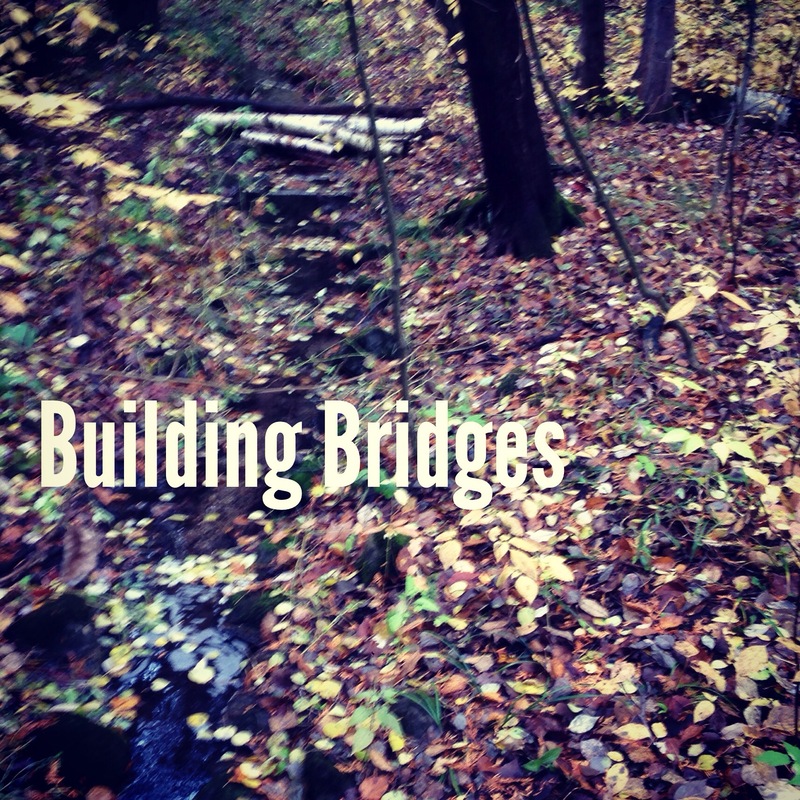 Place based education is developing a relationship with your local forest or natural area. 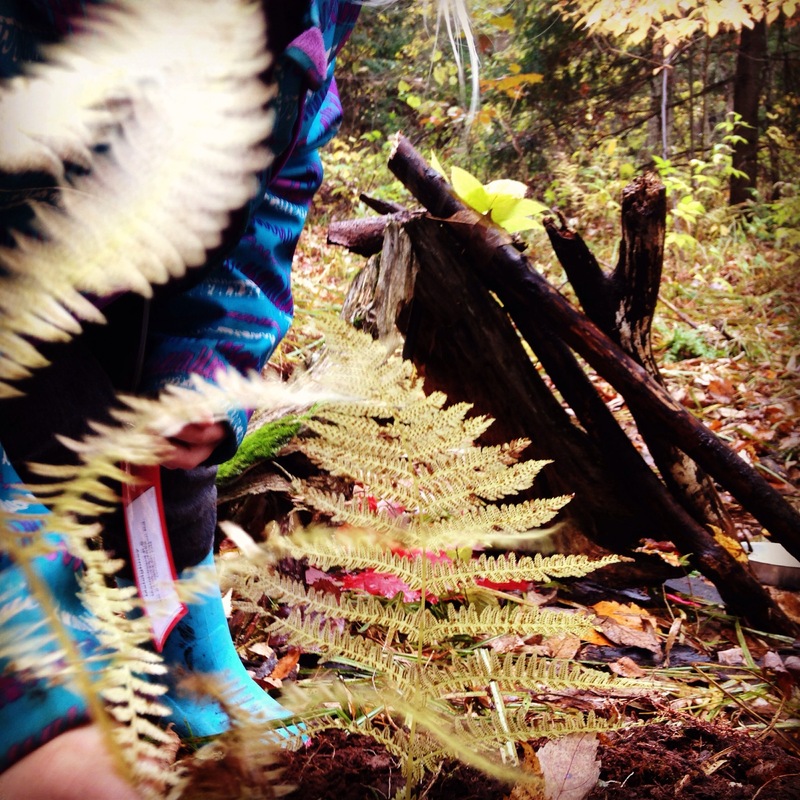 From this relationship everything is born – inquiry based learning, interest in the forest and their learning (academically, socially, physically) and capabilities within it both ecologically, historically and culturally. 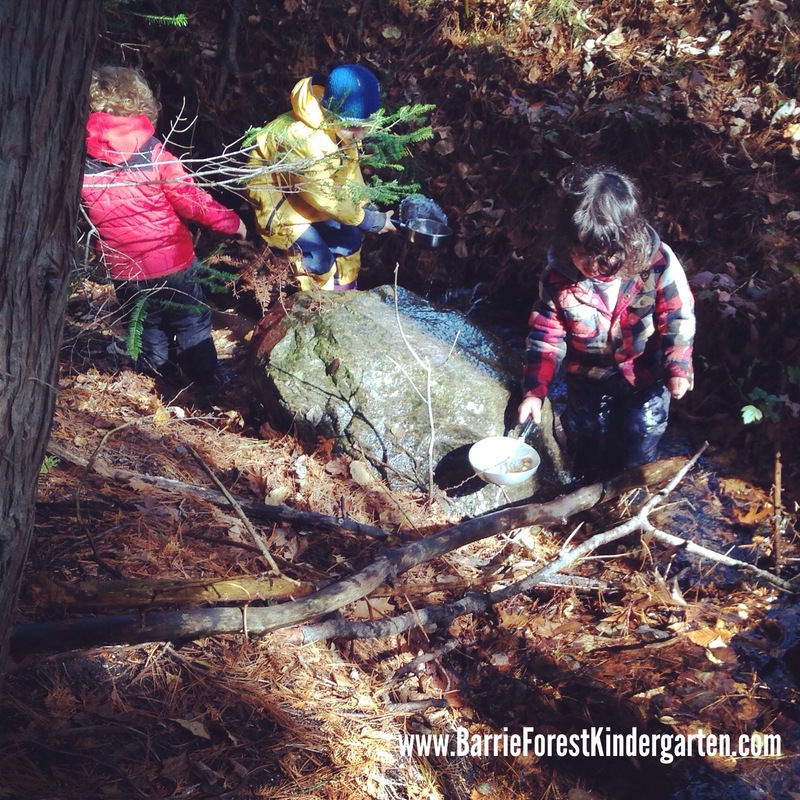 True holistic learning. 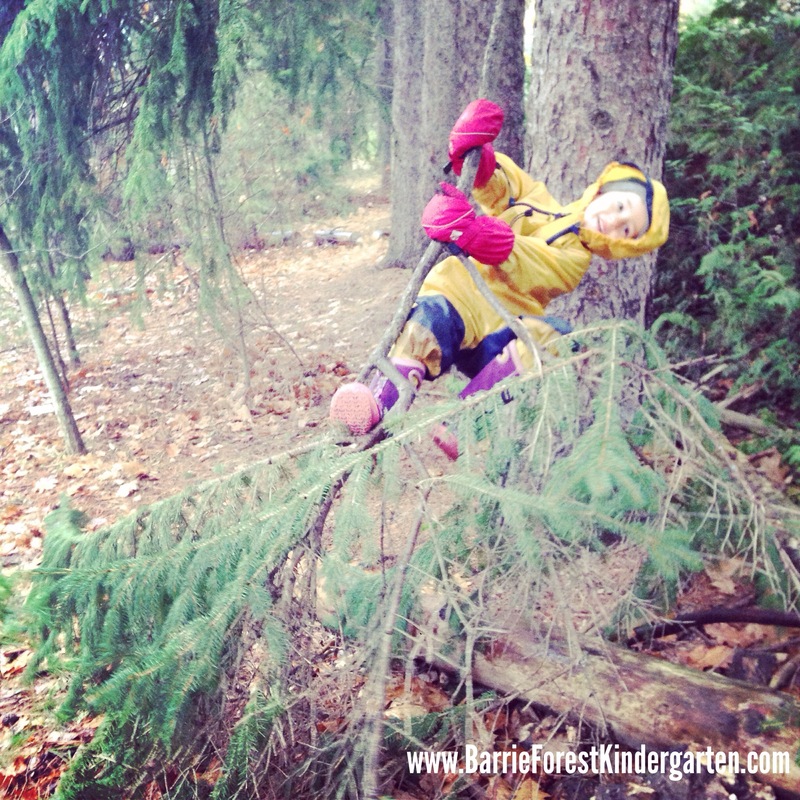 The kids are enjoying the changing of the seasons, building their own relationship with our forest. 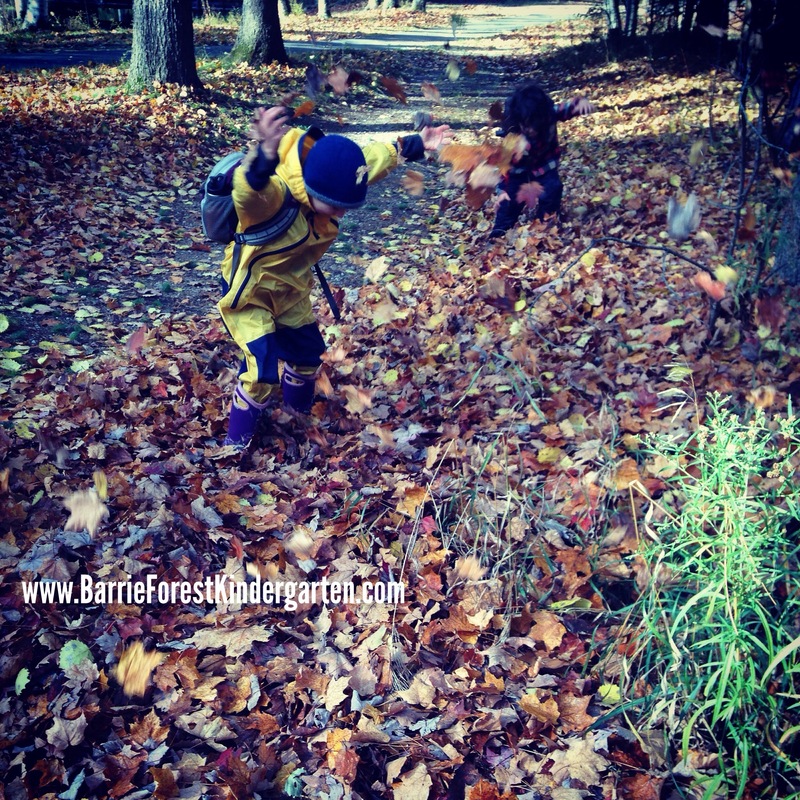 From jumping in puddles to throwing the leaves to collecting acorns and plantain by name. 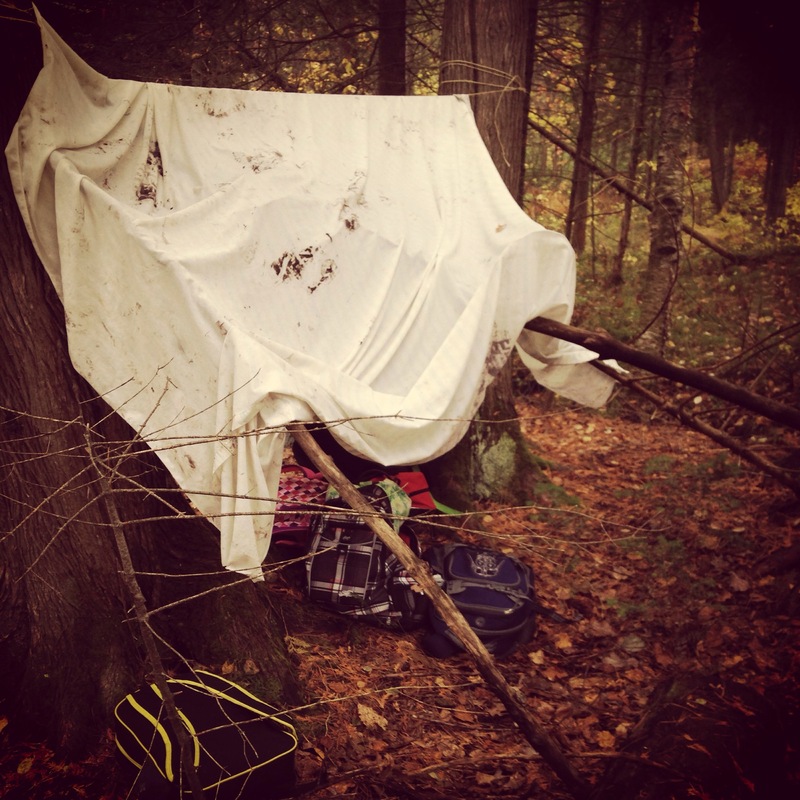 They can navigate to our main classroom by themselves and request their favourite camps instead of waiting for me to list their options when they want to adventure out. The seek comfort in their own sit spots for a quiet moment and also run through the woods using the trees as an additional playmate when they are full of excitement and energy. They also look to the trees, the rocks and the stream to learning to trust the environment and trust themselves to make decisions about their limits and capabilities. 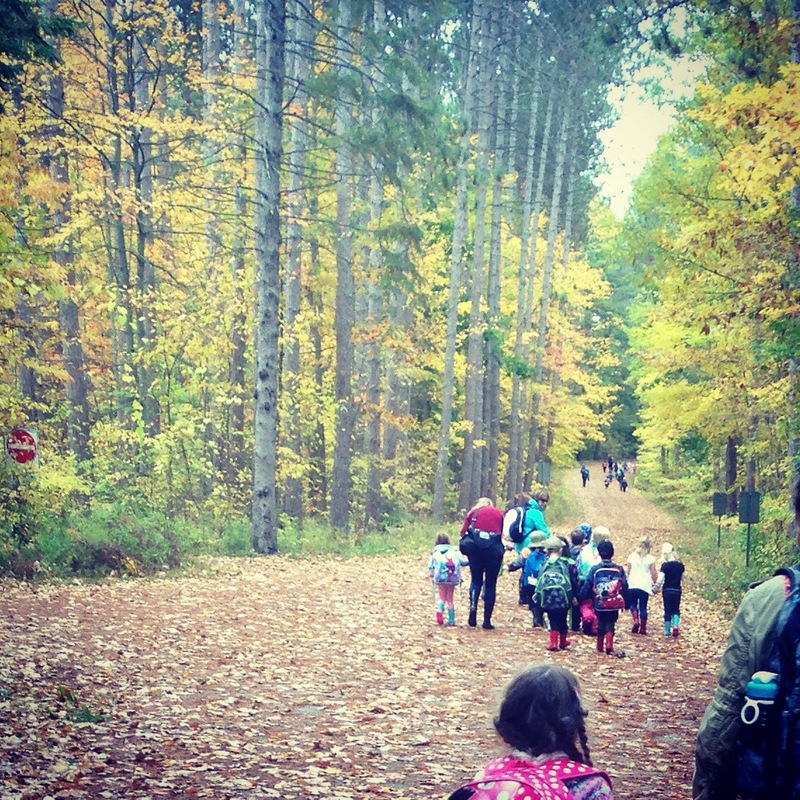 We had our first Field trip with two classes from Marchmont Public School in Orillia. It really inspired my soul to see these 3-5 year olds dive right in and play creative, play messy and play with eachother in a world full of iPads, 300 TV channels, the kids connected with nature in their own way, in their own comfort and then pushed themselves to the next level. It was a great success no matter how you measure. Here are 5 of the ways it was a great success! 1. 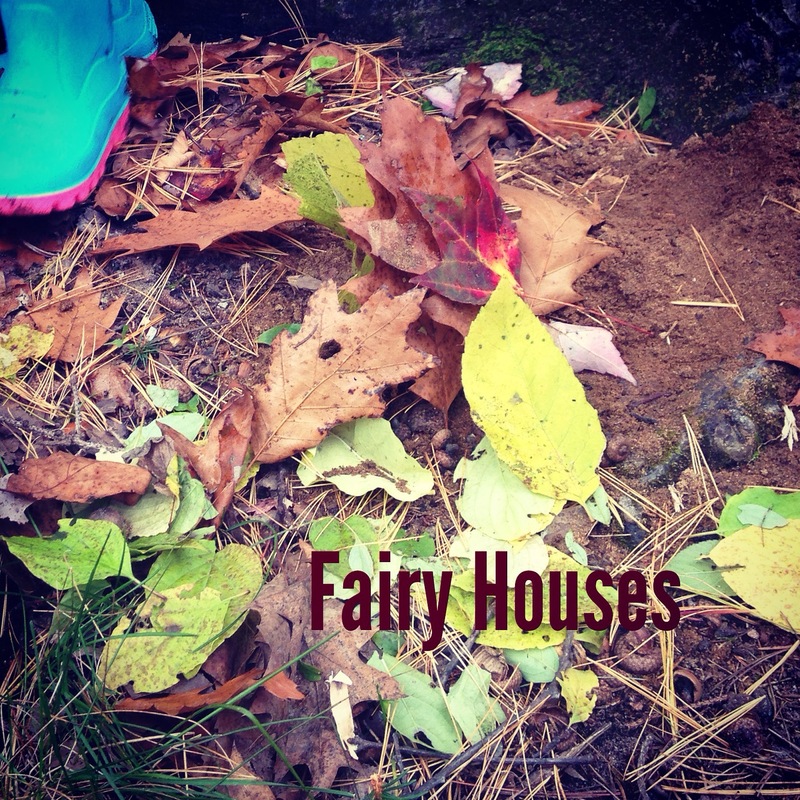 Projects – from beautiful fairy houses to building bridges to shelters from the rain the kids worked together to build, create and beautify. 2. 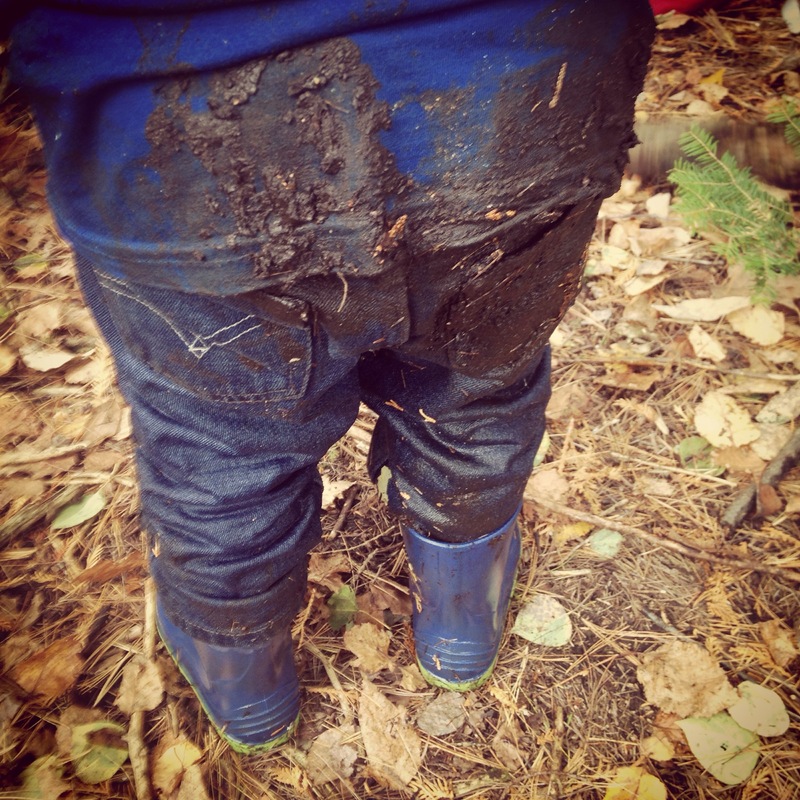 No one went home clean – from muddy pants to muddy hands. And I won’t ever forget the group that had an old fashioned water fight! 3. Screaming, yelling and chanting. “Mud is Great, Mud is great” was my favourite. 4. 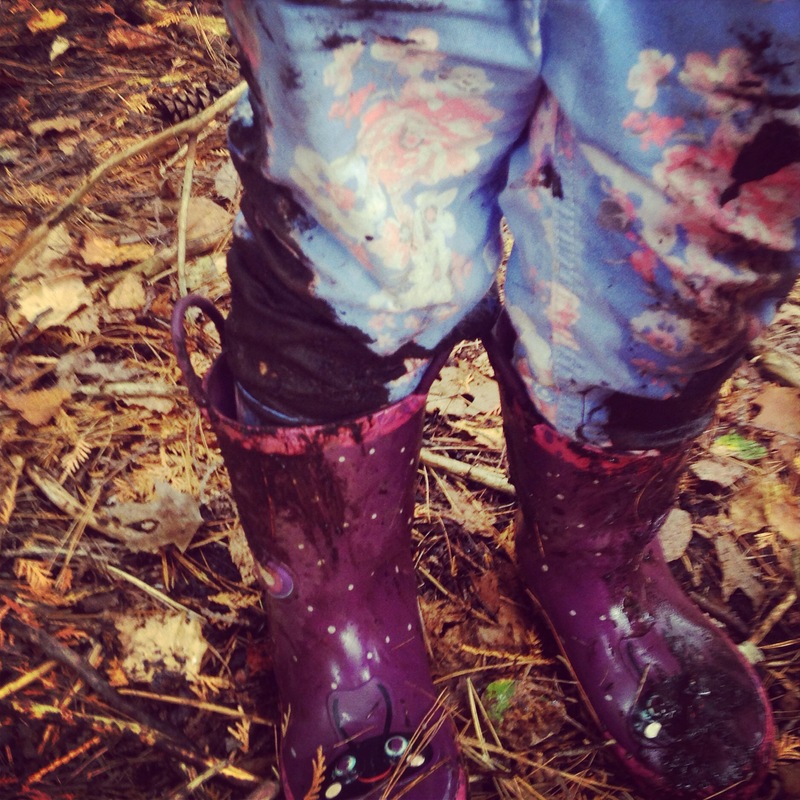 Mud Pies – there was more mud pies, soups and stews than I could count. 5. Sharing, talking, listening – it was great to hear the kids really working things out – from offering to share materials to listening to who wants to participate to working together to build projects the kids respected each other and tried to help where they could! 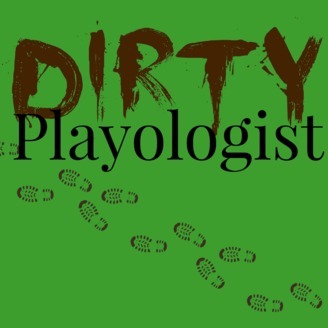 Through child directed play based learning they met 72 Kindergarten goals over 12 areas in the projects, 43 Goals over 8 areas in the Mud Play, 35 goals over 8 areas in the screaming, yelling chanting, 70 goals over 12 areas during mud pie making and 39 goals over 6 areas during the sharing, listening and talking! 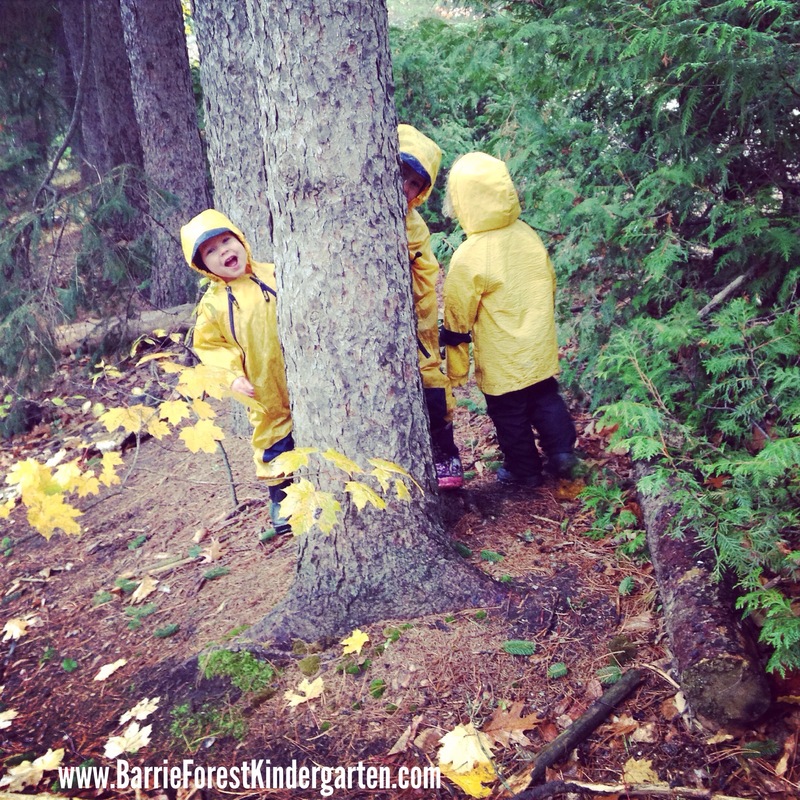 Children outdoors just naturally follow the kindergarten curriculum! 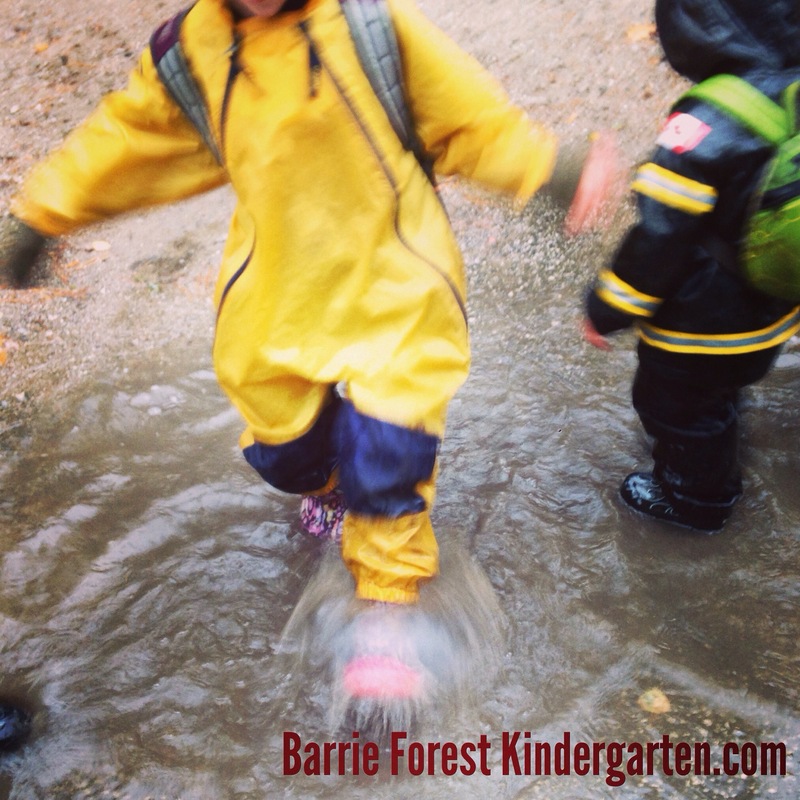 October is shaping up to be a busy month for Barrie Forest Kindergarten. 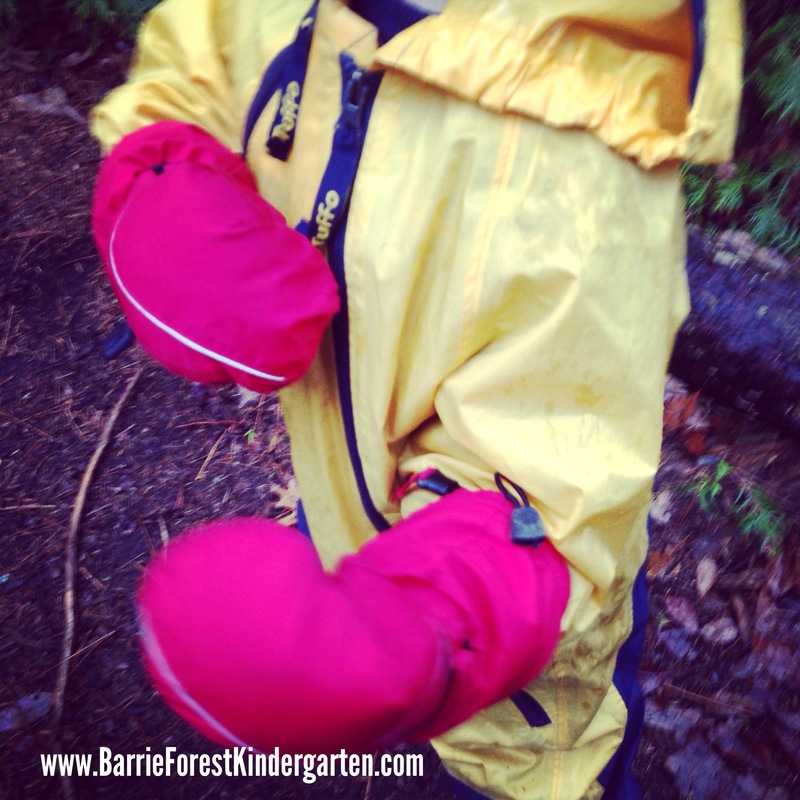 We are preparing for our first ever Barrie Forest Kindergarten field trip with two kindergarten classes from Marchmont Public School from Simcoe School Board! 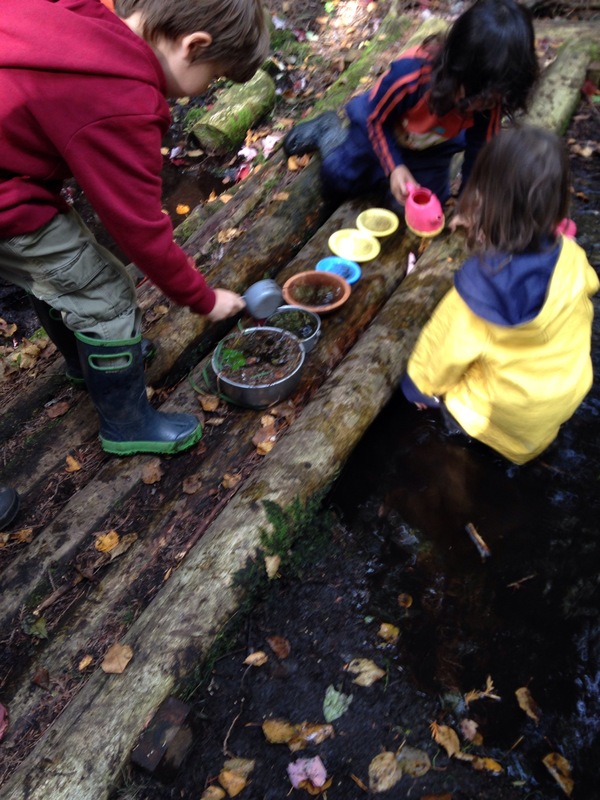 We plan to do hands on learning focusing on child directed play outdoors for both teachers and students and also provide an outdoor inquiry based learning experience. Excited to be partnering with Tiffin Centre for Conservation to provide a great day of child directed play and inquiry based learning! It has also been about the toddlers this month! 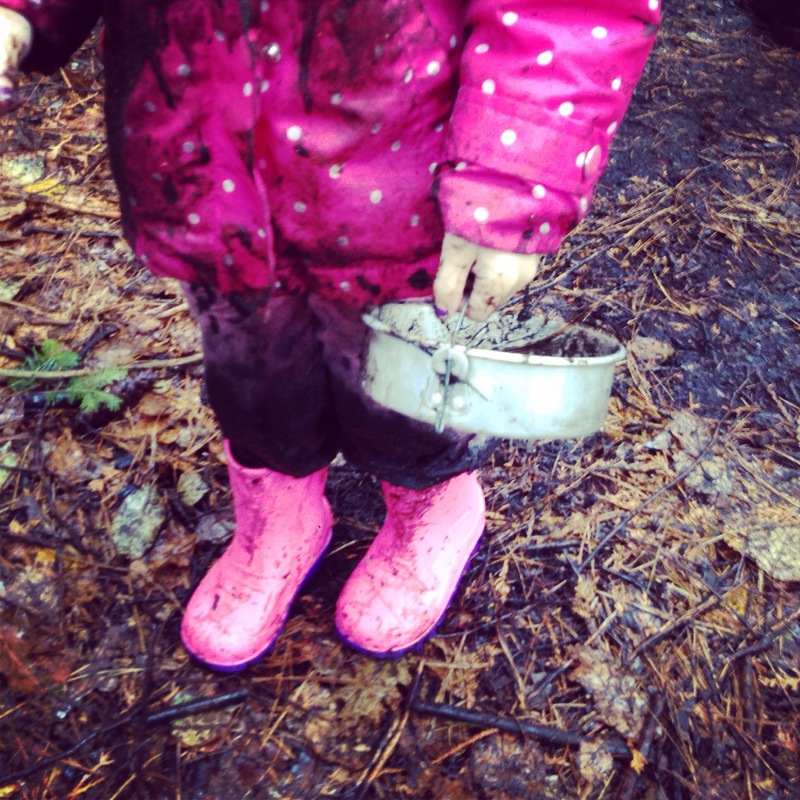 After started our outdoor playgroup last week tomorrow (Friday) will be spent speaking to moms and tots about outdoor learning with Mommy Connections.